2. Wiley, Chuck Tear It Up Spangle (Ohio) 2004 1958/Mar. 7. Nash, Cliff Explosion [unissued] uniss. 8. Howard, Chuck Out Of Gas [alt. vers.] [unissued] uniss. 17. Wiley, Chuck Nothing Matters Anymore [unissued] uniss. 18. Carter, Fred ( You'll Have To) Come And Get It [unissued] uniss. 19. 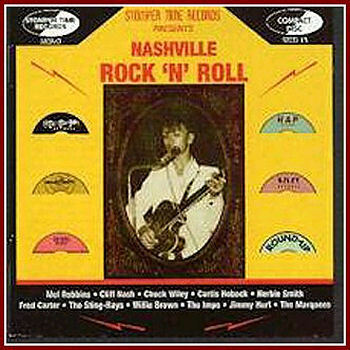 Nash, Cliff No Time For Sisters Do-Ra-Me (Tenn.) 5027 1963/Mar. 20. Robbins, Mel Joy Ride [unissued] uniss. 22. Wiley, Chuck Why Worry About Me [unissued] uniss. 23. Howard, Chuck Out Of Gas Do-Ra-Me (Tenn.) 1403 1959/Apr. 25. Wiley, Chuck Just Ahead Of Me [unissued] uniss. 27. Robbins, Mel Foghorn [unissued] uniss. 29. Wiley, Chuck Shake Up The Dance Spangle (Ohio) 2004 1958/Mar. 33. Nash, Cliff Band Stand [alt. vers.] [unissued] uniss. 35. Hobock, Curtis What A Dream Cee and Cee (loc?) 501 1965/Nov.